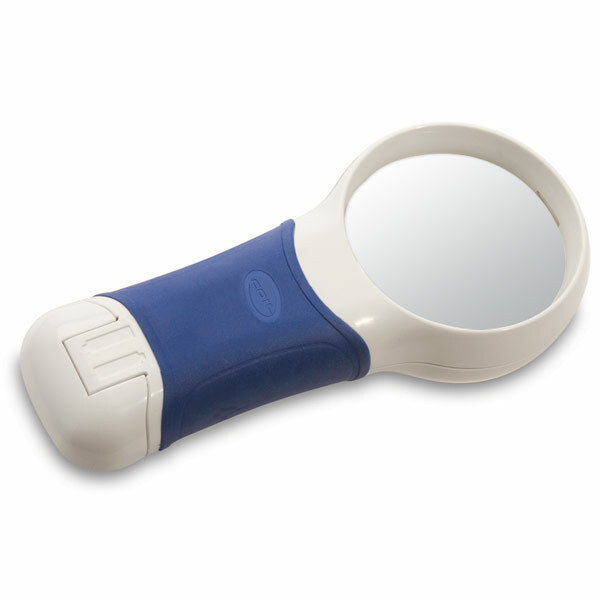 The Coil AT-Max Auto Touch 5X/16D LED Illuminated Magnifier with its round aspheric lens offers a large, low-distortion field of view and uniform LED light across the lens, for an easier reading experience. Its ergonomic handle conforms to the natural shape of the hand, making it comfortable to use for longer periods and easier for the arthritic and those with limited dexterity to hold. The Coil AT-Max is extra lightweight and features an auto touch on/off switch for smooth and simple operation. Batteries are easy to access and change. Included soft cloth pouch protects magnifier while not in use. Eschenbach SmartLux Digital - 5 Inch Color HD Portable Video Magnifier - 2.5 Hrs. of Battery Use!